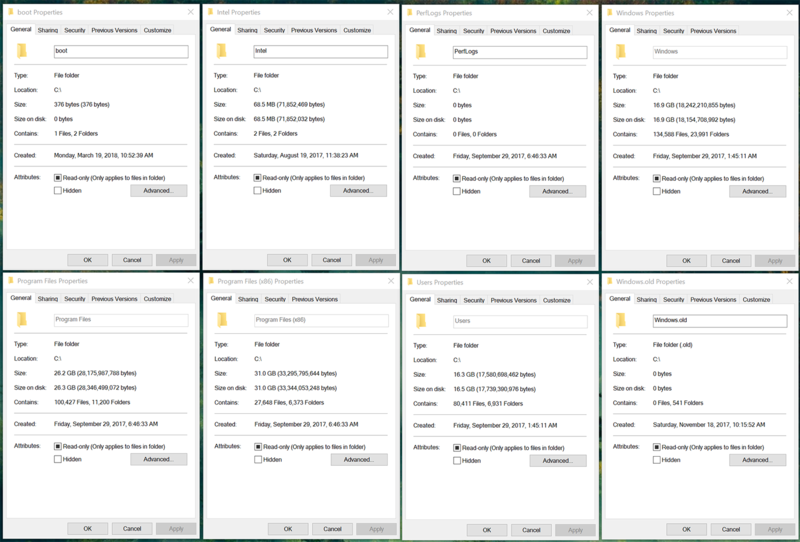 My OS drive is 250GB and is quickly filling up despite the fact that I only use it for applications and the OS (Windows 10) - all other files are kept on other internal/external drives. ...but when I look at the individual folders within the C: drive it only adds up to 92GB. If I go to Disk Cleanup the most I can remove is about 100MB. There are only three Hidden Items on my OS Drive: OneDriveTemp, ProgramData, and $WINRE_BACKUP_PARTITION.MARKER, all of which add up to only 3GB. 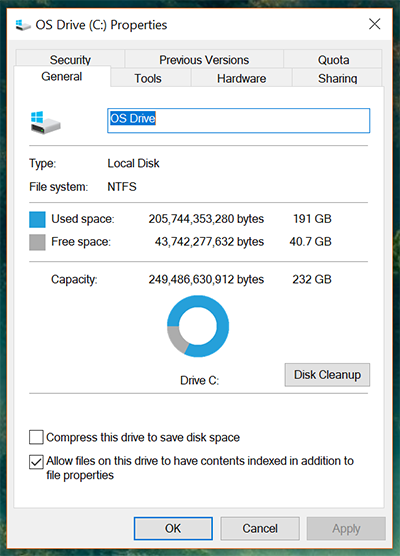 What is taking up the extra 100GB of space on my OS drive? Might help determine what's hogging the space. What are those set at? That "Properties" you're looking at misses a lot of hidden things. Thanks for the replies! Turns out it was a combination of factors but mainly just Windows lying to me. The Program Files folder was 49GB larger than it displayed because for some reason Sea of Thieves wasn't being counted and PUBG was only showing about half it's actual size. There was also a hiberfil.sys file that is 26GB but did not show up on the root of the C: drive even when I specifically told windows to show Hidden Items. Thanks for the TreeSize app suggestion, this showed me everything Windows apparently didn't want me to see. hiberfil.sys (among others) is Double Secret hidden. C:/ Drive Is Being Filled While D:/ Drive Is Saying It Is Empty! Does windows switch hard drives once another is filled?